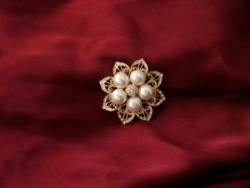 Throughout history, brooches, or embellished pins or clasps, were often used as fasteners and adornments for clothing. The Grecian and Roman empires used a device termed a fibula to secure their tunics, cloaks, and garments.This type of jewelry was formed by bronze and often encrusted with gem stones in the Bronze Age. Although ornamental, these adorned pins also served a functional role in clothing. Scandinavian women frequently used two to attach their pinafore straps together. The larger, more ornamental styles were popularized during the nineteenth century. High necklines required the use of these lovely pins or clasps, but they were also worn on the shoulder of dresses, in clusters, and on coats and shawls. The Victorian era (approximately 1840 to 1900) saw a great variety of brooch designs, such as insects, birds, flowers, floral sprays, baskets, lizards, sentimental motifs such as hearts, cameos, Celtic knots, and more. Queen Victoria's love of jewelry helped to inspire the wealth of designs that emerged during her reign. The brooches of the Edwardian period in the beginning of the twentieth century utilized diamonds and often illustrated a lacy, delicate appearance. Platinum was more commonly seen, and circlets, bars, and buckles appeared more avidly in pin jewelry. Arts and crafts era (coinciding with the Edwardian) brooches saw the first patented safety catch style pin jewelry. Attention to detail and intricate designs were often seen. Pinned jewelry was often seen at the waist as large sash pins or ornaments. Scarf and open-center brooches were also popular. Later twentieth century styles saw a decrease in size. Smaller pins were often worn at the hips or shoulders. Rock crystal, diamonds, and platinum can be seen in pins of this era. Innovative geometric designs paved the way for the modernistic flair of the Art Deco styles of the 1960's. The influx of costume jewelry also influenced brooches, bringing rhinestones, faux pearls, colored glass, and plated metals to the forefront. 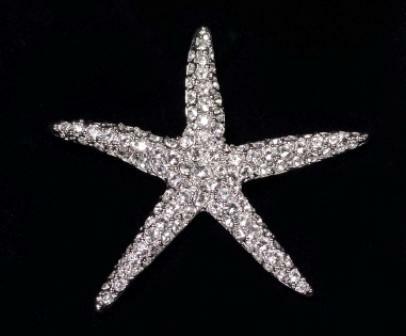 Modern brooches are available in both costume and fine jewelry. Today women wear them anywhere and everywhere, from on the more traditional collar or shoulder to on their bags or jeans. The designs from past eras are often replicated or serve as inspiration in today's jewelry market. While vintage pin jewelry is still coveted, there are also new styles on the scene. Today's styles often reflect simple, but distinctive, designs. They may also appear as seasonal inspirations or as theme-based designs. Tiffany offers lovely contemporary brooch designs that are feminine and elegant. As with most jewelry, prices range from under ten dollars for fashion pieces to thousands of dollars for those from haute or specialty custom jewelers. Whether you buy antique styles or new versions of the brooch, this versatile piece of jewelry can truly lend a unique and very personal sense of style to your ensemble.